Directions: The Shut-In Gap historical marker [ Waypoint = N37 35.114 W90 35.336 ] is located across a low-water bridge over Stout's Creek. From the Fort Curtis marker, return to State Highway 72 and turn right (east). After about 2 miles, there will be an unnamed and unpaved road on the left. Stout's Creek is right next to 72 Highway at this point and you should see the low-water bridge that crosses the creek. If you pass State Highway D on the right, then you have gone about 100 yards too far. The low-water bridge is somewhat rickety. If the water is low, drive across the bridge. The marker is on the left just after the bridge. To get to this area from the marker, continue east on Highway 72. After about 0.3 miles, you will cross a bridge over Stout's Creek. There are places to pull off the highway just east of the bridge. After parking, you can walk back to the bridge. Again, this is a very dangerous section of the highway. Through Shut In Gap passed the most direct route from the Arcadia Valley to Fredericktown. 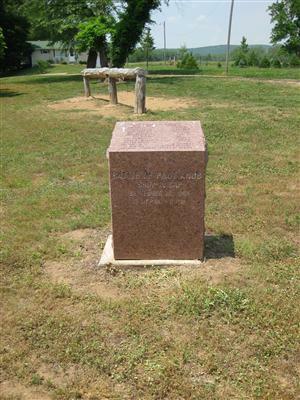 Advance Elements of the Rebel Army rode through the gap undetected and were not spotted until they approached a Union picket post at the Russellville Junction. 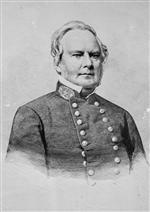 Following a skirmish in Ironton a cavalry detachment led by Major Wilson drove the Rebels back into the gap. After Wilson was wounded he and his men retreated toward Arcadia. Fighting ceased at sunset. The road from Fredericktown to Ironton passed through the Shut-Ins Gap, in between two fairly substantial mountains, both over 1100 feet in elevation. For Price to find another way to Fort Davidson would mean going about 20 miles north to Farmington or about 35 miles south to Greenville. So to get to Fort Davidson, Price's army had to pass through the gap here. "On the morning of the 26th, being rejoined by Major-General Marmaduke's division, I proceeded at an early hour with Fagan's and Marmaduke's divisions in the direction of Ironton and Pilot Knob, at the same time sending forward a portion of Fagan's division to take and hold a difficult pass in that direction between two mountains within three or four miles of Ironton. This was effected rapidly and with success." "Just before the column entered the ' Shut-in,' Lieutenant Pape, either by order or by accident, had taken a road bearing to the right of the one occupied by our main body. I was ordered by Wilson to notify Pape of our withdrawal … I rode into the timber, overtook Pape and told him that his command would be cut off if he did not immediately fall back on the charge. I had hard work to make him understand his critical situation, but we finally came out into the road on the charge. It was already occupied by the advancing Confederates. We charged them upon the left flank of column, they gave way in every direction and we rejoined our command."